Blogging is more commonplace now than ever before. It’s estimated that there are at least 147 million blogs covering topics from technology to Japanese theme restaurants. But regardless of the vastness of the blogosphere and the diversity of blog topics, there are a handful of site features that you’ll likely find in most of them. In addition, readers have come to expect these site features to be available to them when they visit their favorite blogs. This article covers the standard features that all blogs should have. These features are meant to improve the user experience by enhancing community engagement, content sharing, findability of posts, and more. Typically, when site visitors first land on a blog’s homepage, they’re greeted with the latest blog posts sorted from newest on top to oldest at the bottom. This is what blog readers expect to see, but that’s not to say it’s all they want to see. Many visitors will enjoy going through your older posts once they decide that they like what you have to say. Having a post archive — a web page or section in your blog that lists previous blog posts, customarily sorted in a logical fashion such as by date or by category — is an excellent way to draw in more page views and improves the ability of readers to discover content on your site. A post archive can serve as a way to increase the conversion of first-time visitors to steadfast readers because it shows them what to expect if they choose to follow your blog. For existing readers, a post archive gives quick access to posts they want to revisit. It’s not difficult to construct an archive of past blog posts either; most blogging platforms and good content management systems have the capability to display and list your posts. Take for example, WordPress. WordPress has core functions, a core template, and API hooks specifically for dealing with archives (e.g., wp_get_archives and archives.php). 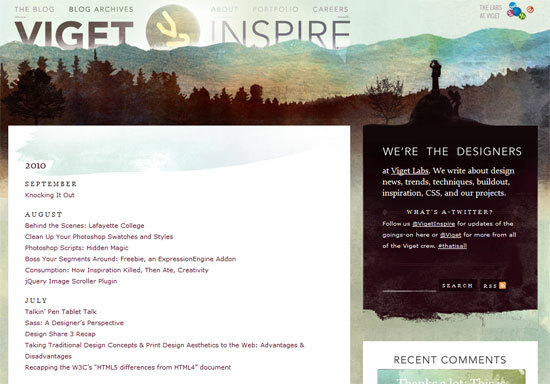 At Viget Inspire, a company blog, posts are listed and categorized per month in their archive page. RSS started out as a simple way to syndicate content throughout the web, though most people didn’t see the resourceful nature of the distribution medium until recently. With blogs being updated frequently, and with the vast amount of blogs out there, RSS has allowed readers to keep up with new content on their favorite blogs without having to visit them regularly to check if something’s been posted. With free RSS feed readers such as Google Reader, it’s easier than ever for web users to stay current with their favorite blogs. Having an RSS feed for your blog has become a necessity. Interested readers will actively look for that conventional orange RSS feed icon signifying that an RSS feed for the site is available. RSS also gives you opportunities to cultivate a loyal following and grow your community due to subscribers staying tuned for your updates. 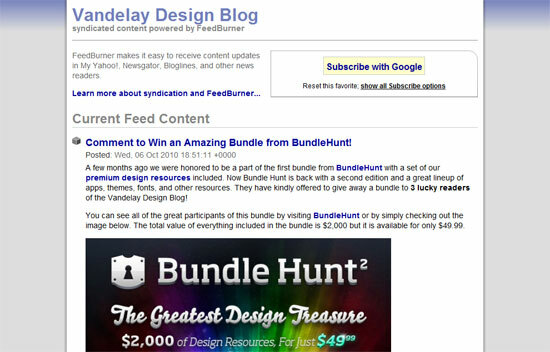 Vandelay Design Blog uses Feedburner for its RSS feed. Most content management systems will have RSS capabilities built right in. If you’re looking for something more robust, you can use a free service like Feedburner that has tools for optimizing, checking, and analyzing the use of your RSS feed. If you’re a developer, build your own RSS feed using the SimplePie PHP class. Coding Horror’s comments are interesting and adds value to the posts being published. A good publishing platform like WordPress or Drupal will have a comment system built in. Services like Disqus and IntenseDebate can supercharge conventional commenting systems with other community-building features such as the ability to vote on comments, integration with social media/networking services like Twitter and Facebook, and the ability to view a commenter’s activity history. Though this feature is primarily for site administrators and owners, it’s also a feature that benefits users. Shady internet marketers think (quite ignorantly, since most commenting systems will assign nofollow rel attributes to hyperlinks posted in comments) that link-spamming on blogs will give them a bit of link juice back to their sites for the benefit of search engine rankings. Without any precautions against comment spam, your comment system quickly decays from something useful to nothing more than additional page weight. Spam comments drown out legitimate comments and leave readers little incentive to read the comments on a post, much less to participate. Don’t let comment spam kill the discussions in your blog. 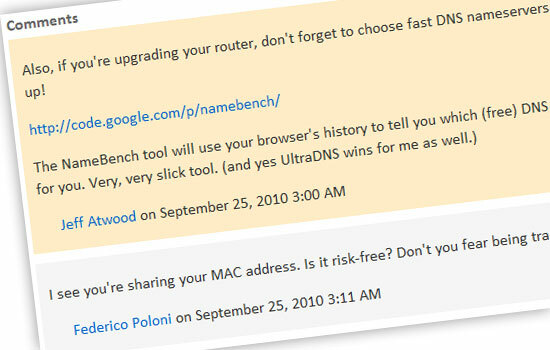 Make sure that your blogging platform has spam protection, not only for your sake, but also for the sake of your community. WordPress, for example, has Askimet. Drupal has the Spam module. TypePad has AntiSpam. Automated spam protection systems will block blatant spam attacks but can’t always get everything, so you could combine manual comment moderation with spam protection features. Aside from visiting your archives, visitors won’t have many other options for finding content in your blog. They can use search engines to search your site’s indexed content (e.g., Google has the site: search syntax), but for convenience, you shouldn’t expect your readers to use another site to locate certain blog posts. Impressive Webs has a search feature at the top of its sidebar. Having a search feature on all pages of your blog is a critical feature for a proper user experience. Content on the web is meant to be shared. Make it easy for your readers to share your blog posts in their social networks by integrating social-media-sharing capabilities on your blog. Mashable has plenty of social media buttons integrated in their blog posts. Most social networking services have APIs that you can take advantage of. For example, Twitter provides buttons and widgets that you can customize and install on your blog. Likewise, Delicious, StumbleUpon, and Facebook have similar offerings. You have to make it easy for your readers to make a connection with you. The ability to contact a blogger is important because the human element of a blog is what makes it appealing to many readers. Readers should be able to reach you for questions, to make comments they’re hesitant to share publicly, to report issues with the site, to share tips and ideas for future blog posts, and to offer collaborative opportunities to you. 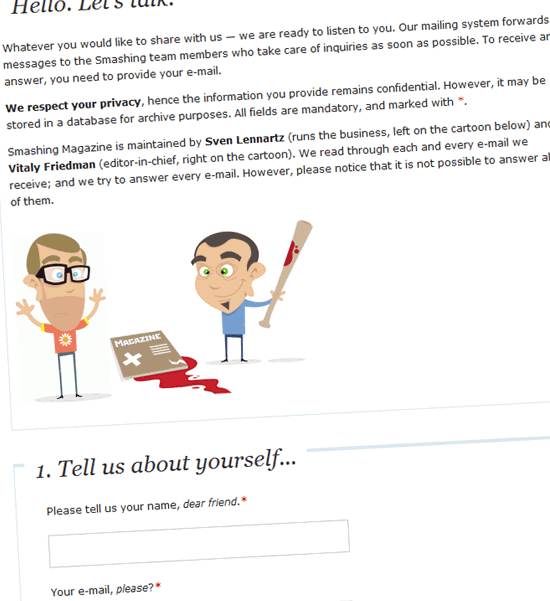 Smashing Magazine has a contact form as well as instructions for communicating with them. Publishing platforms may have contact web forms built in, or at least plugins available such as Contact Form 7 for WordPress and the Contact Forms module for Drupal. You can also consider using versatile third-party form builders like Formstack. Form builders make it easy to make robust web forms and they take the burden of dealing with incoming data out of your own web server. And of course, email is still effective. If you’re not up for using contact forms, display your email address on the sidebar, footer, or contact page. These features are things you should keep in mind when developing a blog design. If you’re stuck on ideas, take a look at successful blogs through Technorati’s Top 100 Blogs list to see what other features are prevalent in blogs. You will notice that many of the above features mentioned in this article are used in various ways and styled in different manners, but the purpose is the same: To give blog readers an optimal experience on your site. As identified by BlogPulse Stats on October 2010.